3 bedroom 3 bathroom private villa in great surrounding. Our promise and guarantee to you is that the villa will be as described on this site. If you have contacts in Mauritius we advise you to have the villa checked out before you reserve. 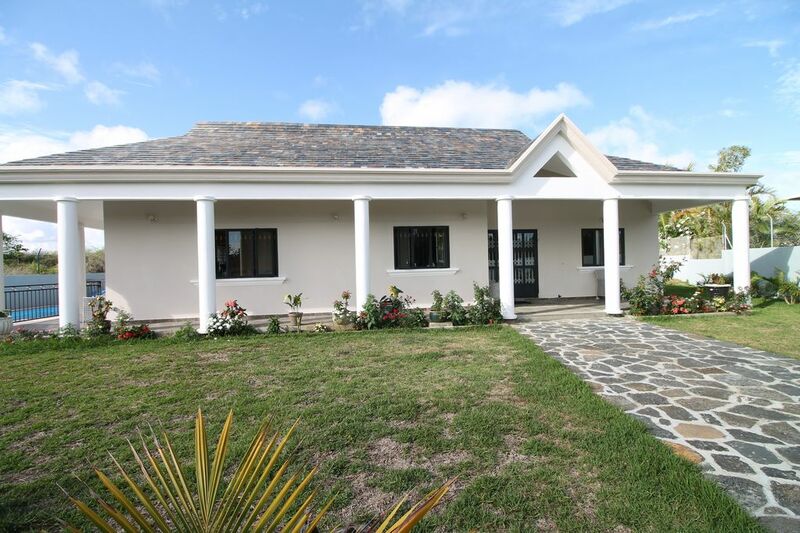 Beaumont villa is a 3 bedroom property built in January 2016. The garden is now established with tropical flowers/fruit trees, palm and coconut trees. It is a spacious detached villa only 10/15 minutes walking distance from the best bathing beach in Pereybere and a similar distance from Grand Baie - Mauritians shopping and nightlife 'capital'. A 10 minute drive takes you to Mont-Choisy - one of the longest sandy beaches on the island. Supermarket and local produce shopping is some 10 minutes away. This splendid villa has spacious full length veranda running on two sides of the building. With a large private swimming pool ( 8 mt x 4 mt ) and a BBQ area to entertain your guests you will undoubtedly be the toast of your party! Or why not just sit in the kiosk with a cocktail and watch the beautiful sunset. It is discreetly managed by husband and wife team Garcon and Baby, who will be there to greet you on arrival, show you where everything is and help you get settled in with minimum of fuss. Enter through the front door into a large lobby ( 9m 64 x 2m44 ). This large area has a desk where you can work on your laptop and a notice board with local maps/information for your benefit. It also has a large bookcase, coffee tables, easy chairs and some storage cupboards at the far end, one of which is for you to store your snorkeling kit and beach items. There are 3 double bedroom, 2 with en-suite and another bathroom with washing machine, ironing board and a safe. We also provide a sofa bed. All the bedrooms have air-conditioning with master bedroom boasting a king size bed. Each bedroom has a double cupboard, a soft chair, 2 bedside lockers and a dressing table. The villa has a flat screen TV with Mauritian( MyT) system installed to enable you to access many channels in different languages. There is a DVD player and High Speed Broadband. The kitchen/lounge/diner is very large ( 13m25 x 13m36 ) and is zoned sympathetically to separate the kitchen, lounge and dining area, yet it is convivial enough to socialise with people from each zone. It is very well equipped. The villa accommodates 6 people and we have provided crockery and cutlery for 12 people. It has ample storage space for cooking utensils and kitchen related goods. A dishwasher, 4 hob cooker with oven and extractor fan and a double sink completes the kitchen. We provide two outdoor BBQ. This big villa ( 306 sq M ) proudly stands on a portion of land measuring ( 1050 sq M ) thus giving you large well managed garden front and back of the property. The garden is lush green and dotted around in strategic places we have planted palm trees, coconut trees, tropical fruit trees and flowers. As the villa is new ( built January 2016 )the garden is not mature as yet but given time it will have a lovely tropical garden with birds, bees and butterflies sharing the flora and fauna with you. english, french, Send inquiry in any language. Google Translate! Born,raised and educated in Bristol in the UK I now live in a small village in the outskirts of the city. Married with 2 daughters both my husband and I work in the Health Care sector. Alice my eldest secured a 1st in M phys in 2013 and is now has a PhD in Physics and Hannah the younger one read International and human rights law at masters level. I holidayed in Mauritius in year 2000 and fell in love with the country and people, hence our investment in this little paradise. This is the 2nd property we have built as holiday let, the other one being a 5 bedroom private luxury villa. Designed and built to our specification the villa provides comfort,space,peace and tranquility with a touch of luxury. Kitted to a high standard it feels like home away from home. Having chosen Mauritius to invest in, we intentionally built this and our other villa some 10/15 mins walk to the beach. This decision was borne from experience gained in 2002 when I first went to Mauritius and stayed in a beach villa. It then came to light that all beaches are public in Mauritius and the all night parties and noise were rather tiresome and a nuisance to say the least. Beaumont villa is also in a very tranquil place for that relaxing holiday. We feel we have the best of both worlds! A short walking distance from the beach yet far away enough for peace and tranquility. - very peaceful area. - private large tropical gardens to the front and back. - private swimming pool. - beautiful villa most pleasing to the eyes. - spacious living accommodation. - first class service. Each bathroom has a shower wet room, a toilet, towel racks, mirror and hooks to hang your dressing gown. All bedroom has air-conditioning. Electric fans in the Lounge. Top loader washing machine. You provide your own washing powder and fabric softener. Clothe lines and a drying rack. Parking facilities for 2 cars inside the perimeter fence and 4 cars outside on your own private road. 4 ring gas hobs and electric oven. Fully equipped for great self-catering experience. Fully equipped kitchen with all amenities. Dining table and chair for 6 people and room for another 6 people on the veranda by the pool. In total 12 people can have dinner together if needed. DVD player provided - take your own favourite films! There is a large bookcase, which is stocked with different genre of books. You are welcome to leave your books behind for others to enjoy. Indoor games such as playing cards, dominoes, scrabble etc available. For outdoor dining or just sitting by the pool with your favourite book and a drink of your choice. Tennis can be accessed at local hotels. Outdoor chairs/tables/bench at your disposal. Golf can be accessed at local venues. Please let us know if any member of your group uses a wheelchair. We will ensure provisions are made to facilitate safe use of the villa and facilities. Smoking is allowed but please respect others. Are you interested in water sport? Just ask and we will let you know what is and is not available. The villa is cleaned once a week and fresh linen provided. Extra cleaning or daily maid service can be arranged for a small fee. We stayed for a week at the villa. It is as in the photos except the garden has matured and is now looking lovely and well cared for. We had an enjoyable stay. All the rooms are very large especially the main living/kitchen/sitting area, beds are comfortable and air con in the bedrooms worked well and there are spacious bathrooms, though no plugs in the sinks. The kitchen is pretty well equipped for preparing meals but for a large party you may find shortages on glasses, though having a dishwasher with a quick cycle makes life very easy. There are thoughtful additions such as adapter plugs and extensions, electric mosquito repellents (bring your own tablets), books and games. We had been travelling a couple of weeks before we arrived at the villa so having the huge and efficient washing machine and lots of space for drying washing was welcome (you have to supply your own detergent etc). There were starter supplies of basic essentials such as washing up liquid but no soap/toiletries and we didn't find any other cleaning materials/cloths so had to buy those too. We thought the welcome food pack could be better - just milk, a bottle of water and some pats of butter. The villa was reasonably clean when we arrived if a bit dusty. Like other reviewers we note that bed linen was not top quality, not matched sets and on the king size bed the sheet didn't fit properly. There were only two of us so we were able to use spare pillows from another bedroom, but otherwise there is just one soft-ish pillow each. Towels were good and again, because there were only two of us we were able to rotate towels and wash them mid stay. The swimming pool is a good size but the step down into it is very steep - so very difficult if you are not very mobile and there is nothing to hold on to. The sunbeds were fine and there were plenty of options for shade, sun and even catching a breeze. We spent most of our time either in the air conditioned bedroom or outside as the living room/kitchen does get very hot and stuffy, and without blinds or curtains on some of the windows it gets heated up in the morning sunshine. Location was great, and a short drive to the enormous Super U and lots of choice of restaurants. There was a significant amount of building development going on while we were there, both in the next door plot and very large development sites nearby so it was a disappointment that we only had one noise free day in our week. Dans l'ensemble, nous sommes satisfaits de cette prestation. Elle correspond totalement à la description faite sur le site : superbe villa moderne et confortable, grandes pièces, cuisine bien équipée, piscine propre, bien entretenue et au soleil dès les premières heures du matin. Nous avons passé deux semaines sympathiques. - les climatiseurs ont besoin d'un entretien régulier : mon mari a lui même dû laver tous les filtres qui étaient très encrassés pour avoir un peu de fraîcheur la nuit (malgré cela,il fallait mettre la clim sur 16°C pour que cela rafraîchisse un peu les chambres). - Concernant le ménage, le premier nettoyage était acceptable (réalisé le jeudi de la première semaine), mais le deuxième nettoyage qu'on a "réclamé" a été fait la veille de notre départ (vendredi de la deuxième semaine) et a été totalement bâclé. Si nous l'avions pas demandé, je pense que nous n'aurions pas eu ce deuxième ménage compris dans le contrat. Avec quelques ajustements sur les seuls petits inconvénients que nous avons pu constater, la prestation de la villa garderait son charme à plus long terme. En tout cas nous avons eu plaisir de passer nos vacances dans cet environnement: c'est une adresse que l'on garde dans nos contacts pour de futures vacances. Vous pouvez réserver la villa Beaumont les yeux fermés, vous ne serez pas déçus. Je suis très reconnaissant pour la critique 5 étoiles d'Anissa. Je suis désolé pour le nettoyage de la villa dans la deuxième semaine qui était due à Noël et au Nouvel An. Mon personnel n'a pas travaillé ces 2 jours. Quant à l'air conditionné, il est entretenu tous les ans, mais si on m'avait prévenu, j'aurais pris des mesures immédiates. Donc, si vous êtes un invité à la villa et que quelque chose ne va pas, je vous conseille de contacter d'abord mon gardien / responsable. Neuf sur dix, il est capable de résoudre n'importe quel problème et il me contactera s'il a besoin de mon approbation. A warm welcome from the charming manager Garcon and his wife BeBe set the mood for our marvellous holiday. Without being intrusive, they went out of their way to see that we old folks were comfortable and had everything we needed.
. The villa across the road was being refurbished and had workmen crawling all over it .. Consider fitting roller blinds in the side windows to allow more privacy when you are using the living room. 2.As sheets are only changed once a week, we found it necessary to wash them at least once between ‘ official ‘linen changes. Providing an extra set of sheets would allow some flexibility with this. We are determined to go to Villa Beaumont again and are hoping to return with more of our family next time. Many thanks Wendy, this was a very good experience. Many thanks to Jill for this 5 star review and we would be delighted to welcome them again in the future. I have made note of the constructive suggestions------thank you. When you book this villa I am here to give you my undivided attention from the time you book to the time you catch your plane back home. Ce n'est pas nos premières vacances passées à la villa. Et j'espère pas les dernières non plus. Nous venons de la Suisse et sommes très content. La villa est très bien entretenue, et la discrète mais tout autan efficace que gentille de la présence de Garçon ainsi que son épouse en font une valeur sure pour notre séjour. Nous avons été (comme d'habitude) très bien conseillé par ce gentil couple. Je recommande vivement la location de cette villa. P.S. Une suggestion pour la piscine, mettre une bâche afin d'éviter tout déchets et autres à se déposer dedans. Merci beaucoup pour un commentaire positif de M. Di Lenardo.Je suis toujours ravi de l'envoyer à notre villa pour ses vacances et j'ai hâte de sa prochaine visite. Même si vous êtes un visiteur régulier à l'île Maurice ou que ce soit votre première fois, laissez-moi vous soulager du stress ...... Nous sommes là pour vous conseiller sur le transfert aéroport / location de voiture / baby sitter ou cuisinier et femme de ménage un service. Si vous voulez l'un de ces services, veuillez simplement demander. PS - J'ai pris note de sa suggestion concernant la piscine. We had previously rented the larger villa 3 years ago as we were a bigger group and as there we only the 4 of us this time we opted for the smaller villa which was nice and catered for what we needed. We found both babe and Garscon very helpful as always but appreciated the privacy we asked for. The villa was very spacious and the pool was a nice addition. We did find the mattress a little hard but eventually got used to it. All in all a very nice base to come back to after a lot of busy long days enjoying the island. The Mattresses: we intentionally went for semi orthopedic mattresses as they are neither too soft nor too hard! Glad Jo and her little group enjoyed the new villa and their holiday in this tropical paradise. If you are planning a holiday in Mauritius please do not hesitate to contact us. Whether it is the two of you or a group of up to 12 let us know and I will ensure your needs are met. We have now stayed in the villa twice now. Excellent time spent with my family. Care takers very helpful, reliable and safe. excellent cleanliness, easy to book the owner Raj very accommodating. The area is safe and there is much to do. Beach is a short walk away, lots of restaurants, swimming in the sea, Paradise- We just did not want to leave. Pool well maintained. friendly and very professional i will never hesitate to recommend this property. We will be going again and know that our holiday will be fab and that we will all be safe. Peace of mind and a great welcome by the owners and caretakers. Many thanks to the Geddes family for booking our villa twice and their vote of confidence in our hospitality and that of our staff. We will be delighted to be of assistance again in the future. If it is your first time to Mauritius let us organise your itinerary for that stress free holiday. From airport transfer to car rental, from a local cook to a baby-sitter or advise you on tailor made trips around the island or at sea ......just let us know and we will do the rest. * Pereybere - A popular beachwith water sports, shopping facilities, restaurants and Bars. * Mont Choisy - One of the longest and largest beach with horse riding at Mont Choisy Sugar Estate. * Balaclava Ruins - The old Balaclava estate ruins. * The Triolet Shivala - The longest village on the island and home of the biggest Hindu temples. * The Pamplemousses Gardens - Botanical gardens famous for its Victoria regia giant water lilies. * Labourdonais Orchards - Hike on mountain bike through sweetly scented exotic flowers and tropical fruit trees. * The Acquarium Maurice - Numerous tanks and pools containing Indian Ocean marine life. * Port Louis - Capital and main port of Mauritius with plenty of character, sheltered by a semicircle of mountains. * Golf - Our caretaker/manager is at hand to advise about golf. For further information about local Tourist attractions and photos please see our website, and ask for details. And if you want to get married on the beach get in touch, we will give you different packages to choose from to make your special day that bit more SPECIAL. Should you want to discuss the rates further please contact us : wendylloydjones@aol.com If you have any questions about the property or holidaying in Mauritius please do not hesitate to contact us.